Arrived in Avila later on Wednesday on the slow train from Madrid. Nice to be in a place I’ve visited a few times. My room this year overlooks the cathedral plaza, as it is in the adjacent hotel. 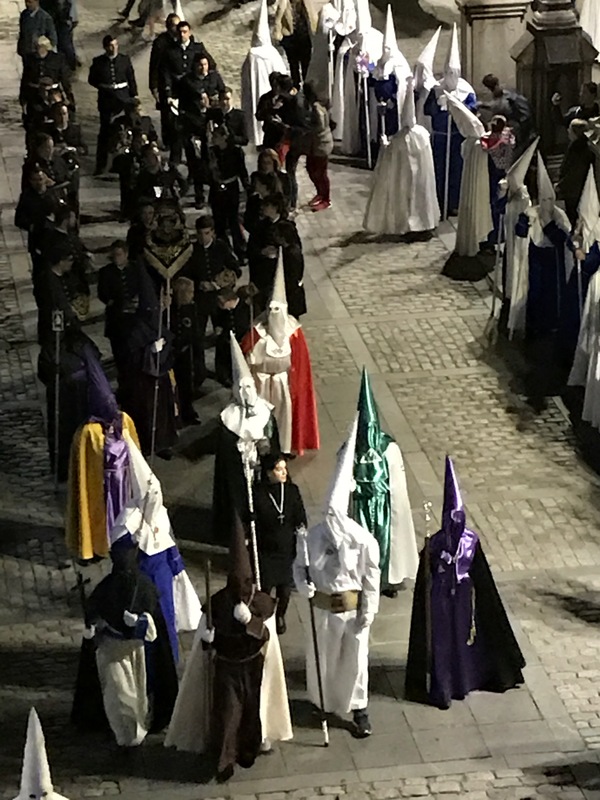 Many parades come through or start or end in the cathedral plaza. Even better, from my window I can see the main, huge double doors of the cathedral. Wow. Better than where I stayed last year at the Parador, in the other end of the old city. 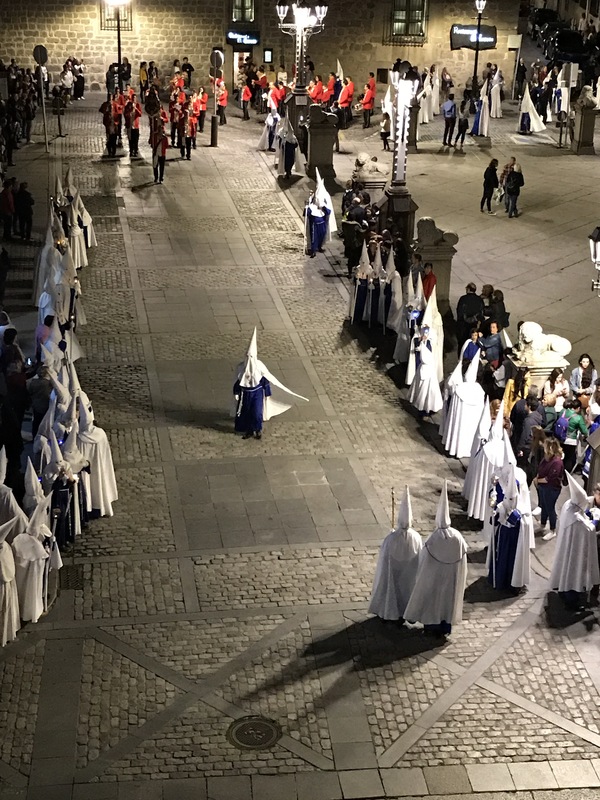 First parade i saw started at 20:30 away from the cathedral but it ended here. 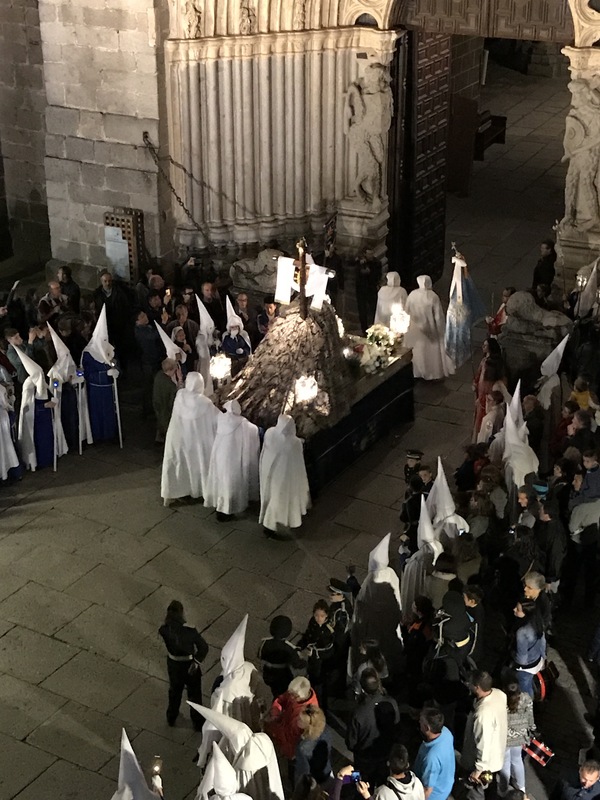 No action in the cathedral plaza until nearly 11pm when a deep drum and the peculiarly discordant music started approaching. 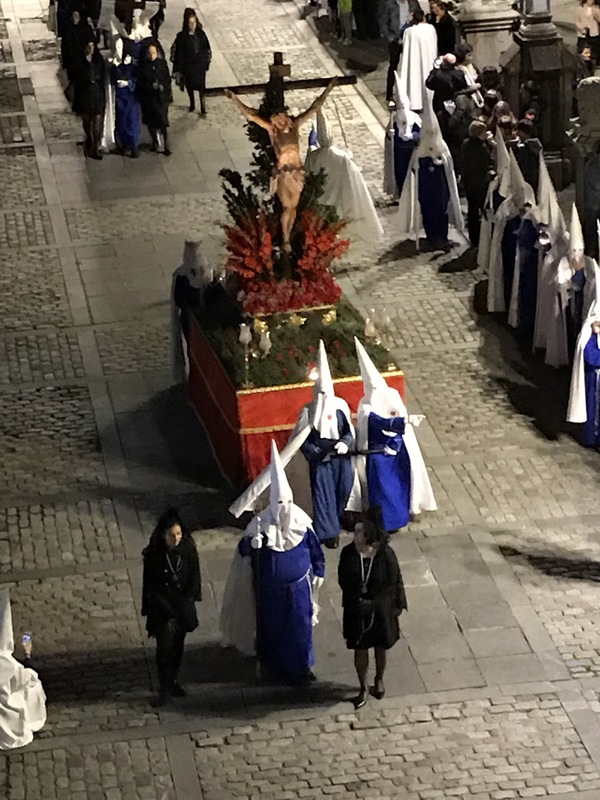 The cofraternity charged with this was the Cofradia de Nuestra Señor de las Augustias. 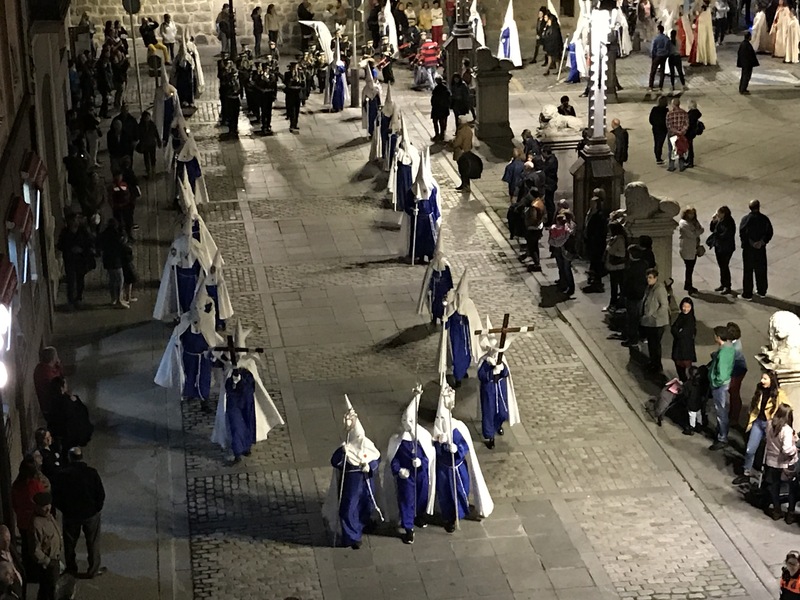 Their habits are a blue tunic with the white peaked hats (like the KKK wore), a white cingula and black shoes. This parade included two bands, 3 hand pulled/pushed carts and representatives of many other confraternities. Best of all, the huge cathedral doors were opened to allow the third cart inside. Spectacular, watching it from above. Absolutely spectacular. Definitely worth coming back for a second look. Suddenly at about 3am on Thursday morning, a deep, solitary drum pounded through the night. 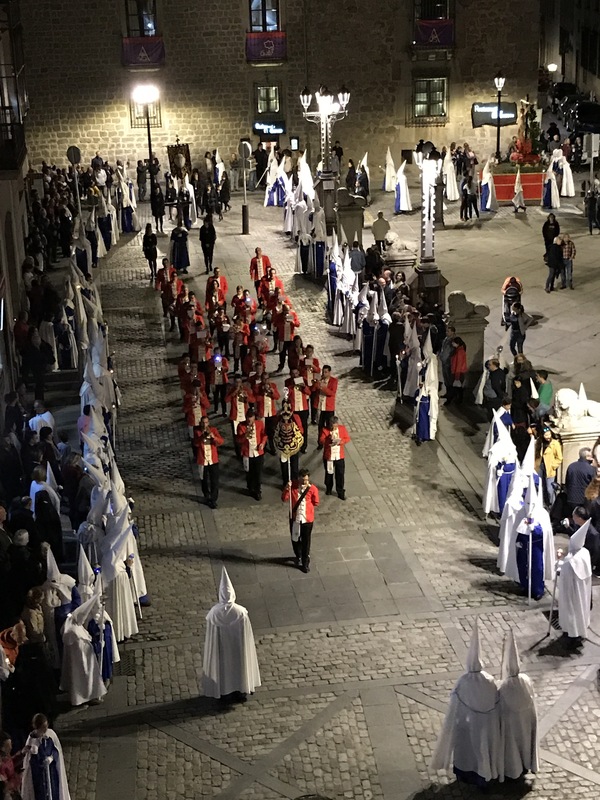 The next parade started at 02:00 and passed on the opposite side of the Cathedral Plaza at nearly 03:00. Black costumes, and shoes (! 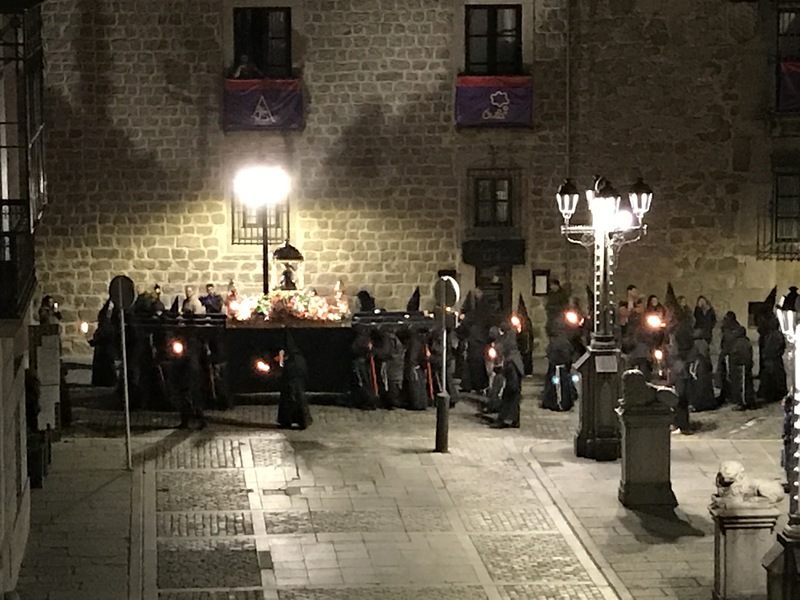 ), for the cofraternity of the Hermanadad del Santisimo Cristo de las Batallas. 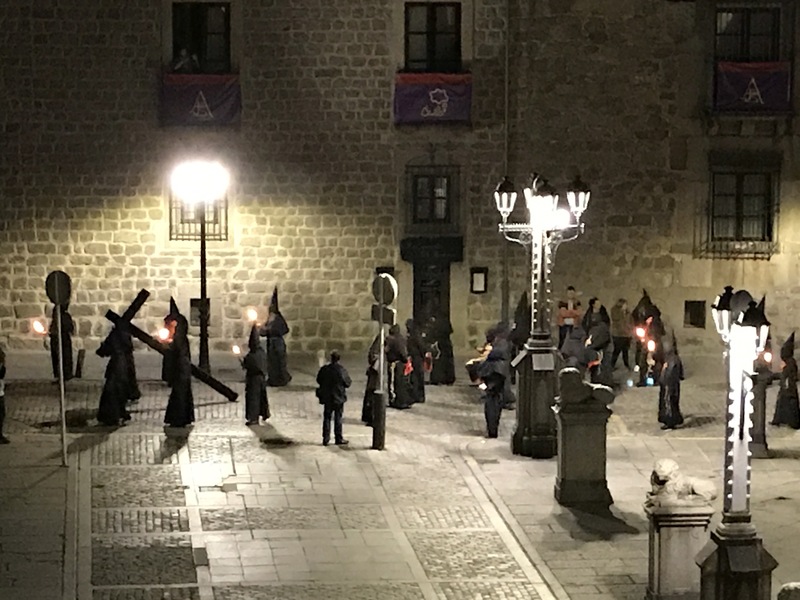 The unexpected bit was the two men each dragging a cross along the street. Yes, perhaps I mean pulling as both crosses moved as though they were light and possibly on wheels. But the second cross dragger appeared to have bare feet. Not easy on cobblestones, a real penance. And then a cart, a tumbril. Or is a tumbril just for executions? This was one of the huge carts with 3D tableaux central to the Christian stories. Hmmm, not quite a juggernaut. Big cart will do. Some are propelled manually and some are motorised. Back to bed. The next procession is not until sometime Thursday evening. Guess not everyone would rejoice in having room 227, overlooking the Cathedral doors and the Plaza. I do. I am so lucky. I think I asked when I booked and that was a very long time ago. The Crucifixion? Yes, it was re-enacted at 12:00 on Thursday. They didn’t wait for me. I wasn’t too worried as I’ve heard the story often. Partly in my bones by now. Besides, I, dear reader, was too busy blogging downstairs while I had enough wifi signal to do so. It’s dreadful here. Wifi, I mean. The hotel is all I’d hoped for. More, even. Except for the wifi. Lamentable. Truly. Eventually the sun arrived. Pleasant temperature anyhow, a little warmer with the sun. So after a tostada con tomate y asciete y dos cafes con leche (toast & tomato & olive oil plus 2 milk coffees) it was too late to recover the hours of sleep hanging out the window watching parades. Another tonight. I love visiting this town, the old section. I walked into Avila last year from Toledo and the outskirts of both were depressing. Hmm. I stick to the old bits of both now I’m not walking sections of the Camino Levante. And then, on my walk around Avila today I found THE toilet again. Yup. The clever, modern, self cleaning type I lined up outside last year, in some desperation, and until all members of a good (clearly compliant catholic) family finally vacated it. Sat. Door popped open too too soon, water flooded from somewhere. 😂. Was so awful that even at the time I had to laugh. LOL. The loo has a memory for greying Australian retirees. Fantastic room but since there aren’t many people you need to get down in there too.